Bipartisan Budget Deal Passes Key Test In Senate : The Two-Way Tuesday's vote was not as close as some expected. Some Republicans joined with Democrats to move the plan forward. 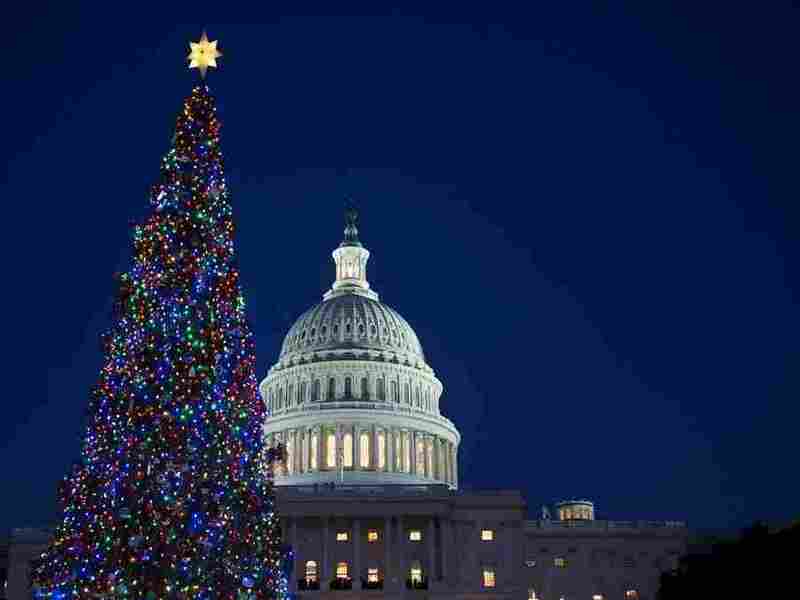 The two-year deal avoids any more government shutdowns until at least 2015. It may seem to some like a holiday miracle, but the Senate moved ahead on a bipartisan budget plan Tuesday. The Senate voted 67 to 33 on Tuesday to move forward on the two-year, bipartisan budget plan that restores some of the automatic spending cuts of recent years, trims spending in other areas and appears to have put on hold until 2015 the bitter battles that led to this year's partial government shutdown. Lamar Alexander of Tennessee, Roy Blunt of Missouri, Saxby Chambliss of Georgia, Susan Collins of Maine, Jeff Flake of Arizona, Orrin Hatch of Utah, John Hoeven of North Dakota, Johnny Isakson of Georgia, Ron Johnson of Wisconsin, John McCain of Arizona, Lisa Murkowski of Alaska, and Rob Portman of Ohio. With the procedural vote, the lawmakers took a key step toward approval of the legislation, which last week won overwhelming support in the House. Tuesday's vote was to begin debate on the measure — a step that requires at least 60 "ayes." The next vote, on the plan itself, requires only a simple majority (51 or more votes if all senators are present). With the Democratic caucus controlling 55 seats, passage is expected. Tuesday, according to The Hill, all 55 senators in the Democratic caucus were joined by 12 Republicans in the vote to move ahead. The vote margin will be slim, but it's looking increasingly likely that the Senate on Tuesday will take the first important step toward approving the two-year, bipartisan budget plan that the House overwhelmingly endorsed last week. If the plan is passed, that means there won't be any repeat of this fall's government shutdown showdown until at least 2015. "Orrin Hatch of Utah, Ron Johnson of Wisconsin and Johnny Isakson of Georgia joined four other Senate Republicans who had already said they will either support the bill or, at a minimum, vote in favor of critical procedural motions that require a supermajority of 60 votes to prevail. That should happen if most of the 55 members of the Democratic caucus also vote yes, which is likely." The Hill's headline is "Senate Poised To Approve Budget," and it reports that "the bill, which sets top-line spending levels for 2014 and 2015, is on track to just barely get the 60 votes it needs to clear the upper chamber." As The Hill adds, "60 votes are required to end debate on the measure. Only a majority is needed on final passage." The Washington Post's headline is "Bipartisan Senate Budget Deal Appears Likely To Pass." The Wall Street Journal also says the legislation "seemed likely to clear a pivotal procedural vote." According to NPR's Tamara Keith, the first vote — to end debate on the measure — is expected to happen later this morning. That would set up a vote on the plan itself by sometime Wednesday. Passage then would require only a bare majority of the 100 senators. Of course, the outcome isn't certain until all the votes are counted. NPR's Ailsa Chang tells our Newscast Desk that there's a chance that at least a few of the Senate Democrats will oppose the plan. "Some of them say they resent larger pension contributions federal employees will have to make," she reports, "and they're also upset that the compromise did nothing to extend unemployment benefits set to expire on Dec. 28." The majority of the Senate's 45 Republicans oppose the measure, Ailsa adds, because "the legislation reverses some of the across-the-board spending cuts that were scheduled for January." We'll watch for news on the vote and update.